There's alpine views from every mountain hut on Aspen's four ski mountains. Forget movie stars and fur coats, Craig Tansley reveals Aspen is the Byron Bay of the ski world…man. It’s Friday night in earth’s most celebrated ski town yet its pretty, snow-covered sidewalks are cluttered with unwashed (and mildly washed) sexagenarians in every conceivable shade of tie-dye. Thick, unruly beards threaten to burst into flames as fat, pungent-smelling doobies are passed from mouth to mouth; I’m as high as a kite just catching the backdraft. Shakedown Street – Aspen’s most popular Grateful Dead covers band (and there’s an awful lot of them about in Colorado) – are playing at Aspen’s BellyUp Bar. It’s sold out… has been for weeks, by the time I make it through the doors the band have launched into the Dead’s classic The Music Never Stopped and three generations of die-hard fans are forcing ski-damaged limbs to bend and contort on the beer-soaked dance floor. While Jennifer Aniston might come to Aspen every Christmas and Kevin Costner owns the fanciest house in town, the truth is it’s the dead-heads… the hippies… the counter-culturists… who rule this town. “If Jerry Garcia (Grateful Dead’s iconic guitarist) was still around and he ran for mayor no-one else would get a vote,” a dread-locked ski instructor tells me. Aspen long ago earned its stripes as the star-spotting capital of the skiing world, but at its heart it’s just a rainbow village in the Rocky Mountains that John Denver loved to sing about (just think: Byron Bay covered in snow). For every designer store selling $30,000 fur coats, there’s a dark and dusty cowboy bar serving ice-cold $2.50 American beer and 45c buffalo wings; or a thrift store selling the kind of ski gear Aniston probably wore as a kid. “Paris Hilton might be in town, but hell, it’s not like she’s going to be with us downing $3 beer and shots at Little Annie’s bar, is it?” asks local barman, Eric Angus. And therein lies Aspen’s appeal; you can view the passing parade of beautiful people (and nowhere does beautiful people better than Aspen) from the comfort of a well-worn bar stool. In many ways, Aspen’s past mirrors that of our own rainbow icons, Nimbin and Byron Bay. Formerly the domain of God-fearing ranchers, Aspen lay siege to hippies and counter-culturists in the late ‘60s and early ‘70s, led by Hunter S. Thompson. In 1970 he even ran (unsuccessfully) for mayor. As the greed of the ‘80s and ‘90s threatened to turn Aspen into just another ski resort conglomerate, the hippies fought hard against developers to ensure Aspen kept its small-town vibe. I’m perched on a bar stool in Thompson’s old hang-out, the Woody Creek Tavern, 10 minutes drive from town. If anywhere’s the antithesis of Aspen’s sophisticated global image, it’s this place with its tattered walls and simple bar grub. Aspen’s full of these type of establishments. While the Caribou Club on Aspen’s East Hopkins Street charges $20,000 for life membership, across the street you can order a $2.75 chicken taco and a $2.50 beer at local hang-out, Zane’s Tavern. Locals like to take their own form of ‘swanky to skanky’ bar tours after skiing, starting with the private jet set at hot spots like The Terrace Room at the Little Nell, and ending up somewhere you can order a round of beers and shooters for all your buddies for less than $20. Even on the mountains themselves, Aspen has its own unique touches. Over 50 shrines have been built all over Aspen’s four ski mountains to hippie icons like Jimi Hendrix and Jerry Garcia – devotees visit every week and restock Jerry’s marijuana needs in the afterlife. I first fell for Aspen a decade back; having spent my childhood in Byron Bay, the parallels between the two destinations made me feel instantly at home. Like Byron Bay, it’s the kind of town you can spend a week in and know everyone’s name, provided you avoid the tourist traps. But quite aside from the alternative ambience, it’s worth remembering Aspen is the world’s best ski destination. Built along the ridiculously pretty Roaring Fork Valley in central Colorado, Aspen is actually made up of four ski resorts, all available on the one ski ticket. 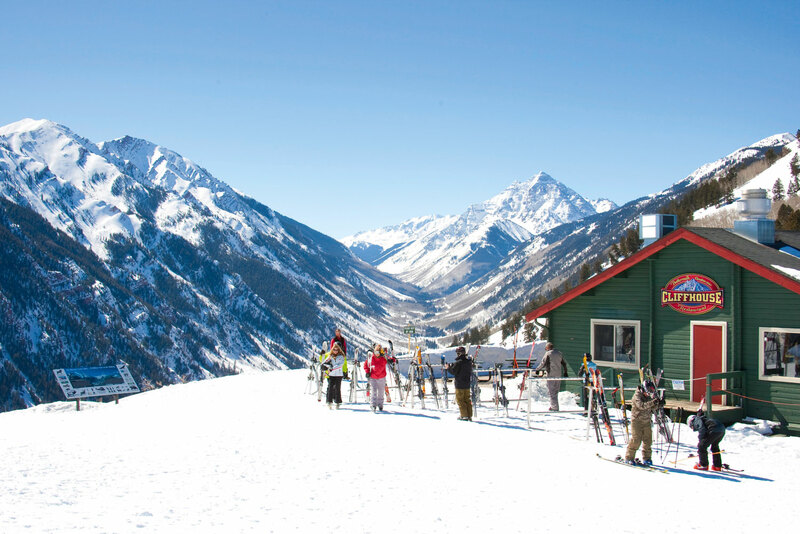 Skiers can access Aspen Mountain, Aspen Highlands, Snowmass and family-friendly Buttermilk Mountain, all located within a short (free) bus ride of each other. What this means is every type of skier is catered for, Buttermilk Mountain is the United States’ best beginner mountain, Snowmass has the most vertical metres descent in the entire US, while Aspen’s backcountry terrain offers some of the most challenging skiing on earth (the Highland Bowl at Highlands is one of the world’s most famous inbound ski challenges). Aspen might have the best après ski scene both on its ski mountains and in its rustic little mining town, but it’s the all-natural pleasures in Aspen that really make the place. One night I shun every one of the town’s 50 plus cafes, bars and restaurants and hike all the way up to the top of Aspen Mountain. Nothing but a full moon lights my way as I ride freshly-groomed corduroy snow all the way back down. “There’s a Ute Indian saying (the first inhabitants of Aspen) that warns if you stay overnight here you’ll never be able to leave,” a long-time local tells me one night at Little Annie’s. The best snow falls between late December and mid-March, although spring conditions in late March and throughout April mean you’ll beat the crowds and get more sunshine. Avoid school holidays and President’s Day Weekend (16-18 Feb 2013). Nowhere offers such diverse skiing experiences with endless après ski opportunities quite like Aspen; and the best thing is Aspen is as much for you as it is for Paris Hilton. Like anywhere in the States, you’ll be sweating on tipping procedures from the moment you arrive. Keep a fist-full of dollars handy. • Check out the Aspen Daily News – it’s free and lets you know about upcoming events as well as providing an insight into everyday Aspen life. • Go green and take the free buses that circle town to each ski mountain every 15 minutes. • Don’t get too paranoid about security – locals leave skis out overnight and only lock their doors in summer to keep bears out. • Be careful in the backcountry – only go there if you are an expert skier or have a guide. Aspen in summer - is it even better than in winter?